No, really. I know they're not all black and green, but look at the little snake logos — those are definitely Razer products. 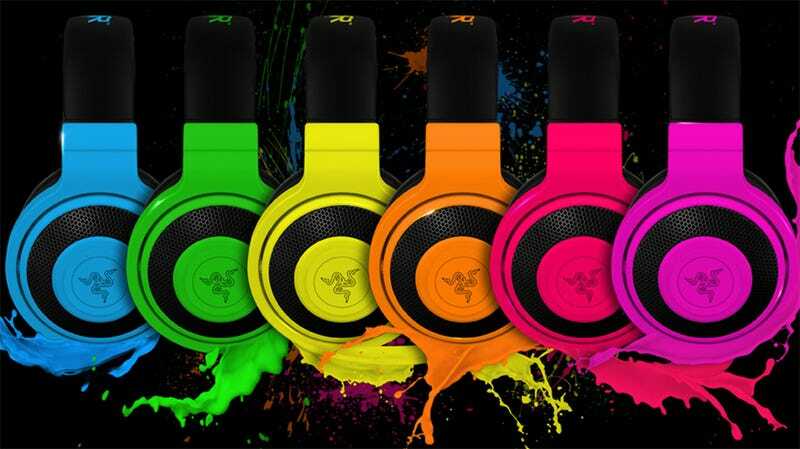 Razer Kraken headphones and headsets, now in six vibrant colors. I'm so proud. "Our community has been asking for color options in our product lines and the Razer Kraken Neon Series offers just that," says Min-Liang Tan, Razer co-founder, CEO and creative director via press release. "We chose our most popular family of headsets and headphones for special stylization and are releasing them just in time for the summer months. The six colors give way to a multitude of options. I can't wait to see the photos our fans send us." Makes me wish I were at E3 so I could find him and give him a big-old bear hug. And look, there's also a special World of Tanks edition headset. Fans of the black and green need not fret, however. Razer's E3 announcements also include a health dose of the Matrix, in the form of the first official Razer PC case. They've partnered with NZXT to create the H440, a 100 percent steel beast of a case that really should have been released earlier this year, when I was building a damn computer system. You know how the PC hardware industry's accepted blue USB ports as an unofficial standard for USB 3.0? Razer doesn't give a damn. Finally, Razer is looking for beta testers for its Nabu smart band. Mmm, there's the black and green again. Interested parties can sign up at the Nabu web page for a chance to beta test the device for a single dollar.